Residents of Melbourne and Adelaide may be more at risk from death during an extreme heatwave than their counterparts in Sydney and Brisbane. While the residents of Australia's northern east-coast capitals may curse their sweaty summers, UTS researcher Dr. Thomas Longden has found that people in these cities were less likely to be caught out by an abrupt and extremely hot heatwave. 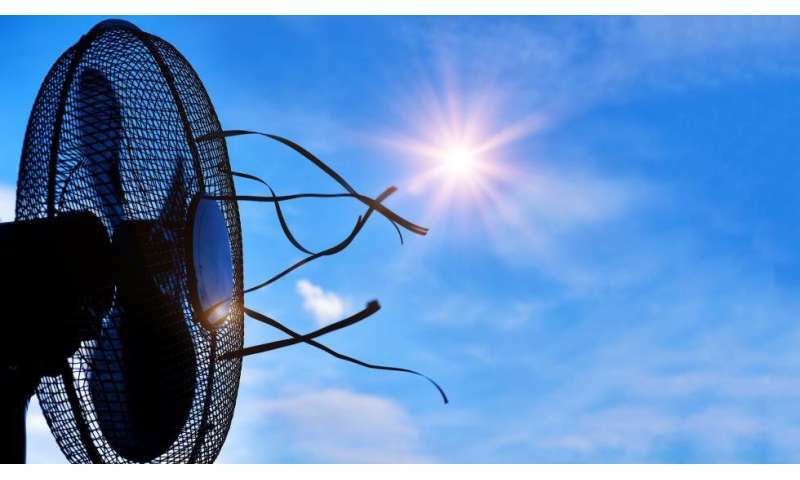 "While Sydney and Brisbane have hot summers, most of their summer days tend to be of a similar temperature and this assists people to acclimatise to the heat," Dr. Longden, from the UTS Centre for Health Economics Research and Evaluation, said. "In Melbourne, Adelaide and Perth however we have had extreme heatwave events with three day average temperatures spiking up to 12 degrees Celsius above the 30-day average. These events were rarer in Sydney and Brisbane during the period between 2001 and 2015." "These abnormal events are more likely to catch people out and means that they are unprepared for the extreme heat." In a study, published in Climatic Change, Dr. Longden used data from the Australian Bureau of Statistics and the Bureau of Meteorology to track daily temperature and mortality between 2001 and 2015. The study used a BOM measure, Excess Heat Index (EHI_A), that captures a lack of acclimatisation to hot temperatures by tracking the difference between the three-day average temperature and 30-day temperature average. "A lack of acclimatisation is an issue due to the physiological impact on people's thermoregulation." This explained why some of the most deadly heatwaves occurred in regions, such as Melbourne, that tend to have more moderate average temperatures, he said. Dr. Longden said his study showed the largest number of deaths occurred when the three-day average temperature was more than 7 degrees Celsius above the 30-day average. Between 2001 and 2015 Melbourne and Adelaide had days where the EHI_A was above 12ºC, with one of the hottest heatwave events occurring in Adelaide between January 27-30, 2009. These four days had three-day average temperatures that were more than 10ºC above the 30-day average temperature and had its warmest night on record with a minimum of 33.9ºC. Another extreme heatwave occurred in Melbourne during 2014 when the city experienced temperatures above 41ºC on all days between January 14-17. Dr. Longden said the study had implications for the type of weather events that should trigger heat health alerts and suggested changes to policy to improve how and when people need to adapt to heat.